As of late, the Smart Dolls by Danny Choo have been occupying my mind. Currently, Smart Doll offers a core line of characters in 1/3 scale, however, the Smart Doll really caught my attention when I saw that they were working on a 1/6 scale doll to come out this winter. They are made of vinyl, and not resin. Vinyl seems sturdier than resin (this might be a misconception of mine though). The core dolls are based off of characters, with names and backstories, and a signature look (which could be changed of course to base the doll off of an OC to the owner’s desire). In a way, I find this part similar to Blythe dolls in that once I choose a doll/character, I can tweak the doll to suit my aesthetics, whether it’s by changing her hair, changing her eyes, or dressing her a certain way. I already know that I’m not the faceup master, so having a cute default face (like a stock face for the Blythe doll) is a plus. The 1/6 scale is so tempting because of the possibility that I might be able to share wardrobes between my blythe dolls and whatever Smart Doll I add to my family. But… the more I look at the 1/3 scale dolls, the more I wonder whether I wouldn’t enjoy a big poseable doll also! I hope to get a smart doll by the end of this year (whether it’s the 1/6 scale or the 1/3 scale, time will tell). Actually, I’m half hoping that this Smart doll obsession is a phase XD. They are mighty expensive. When it comes to the size of my dolls, scale is very important to me – more important than I realized when I first started collecting. From a budgeting standpoint, the semi-fiscally responsible me would argue that having different scale dolls means also having to purchase different sized wardrobes. The cost of doll clothes and shoes really adds up quickly! Sometimes I’ll think about the amount I’ve spent on clothes, and realize that I could have purchased a whole new doll. Then I quickly poo-poo on that thought, because having a variety of clothes and shoes to choose from helps me to better enjoy the dolls I have. Also, purchasing a wardrobe that’s sort of one size fits all my dolls helps alleviate the buyer’s remorse. Also, I’m not one for heavy lifting, I can’t imagine how one would travel with such a big doll! Maybe I just need one to understand their awesomeness. I do love seeing photos of these big bjds, and all the details that go into them. There’s also something quite magical of having one that looks so lifelike. I think if I was more of a dedicated writer, and my dolls personified a character in my stories, I would be able to better appreciate a doll to that scale as a source of inspiration. 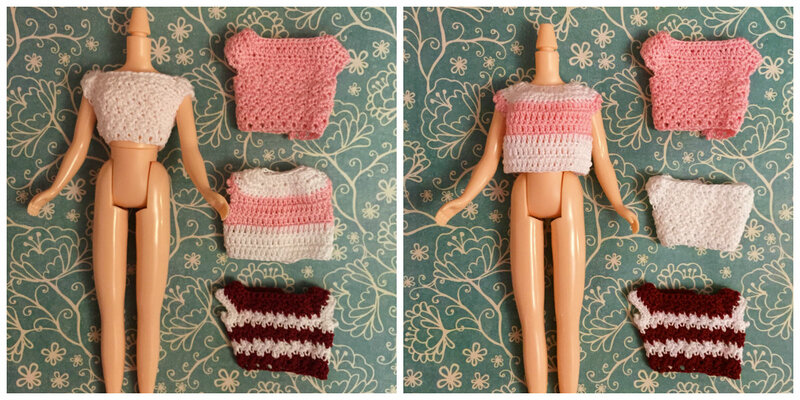 Also, if I was better at sewing, I’d probably love having a big doll that can grandly model my creations. For dolls smaller than 1/6 scale, the only experience I have is with the sole Middie I owned, Bryn. I’ve since sold her and all of the middie scale clothes and shoes I had. I want to say that Middies are 1/10 scale? She was super easy to tote around, and adorable in her own right. But I think, if you expect all you expect out of neo from a middie, you’ll find the middie to be a bit lacking. The big reason why I decided to sell her was that I would not reach for her as much as my neos. With my limited number of middie outfits, redressing Bryn wasn’t as fun. 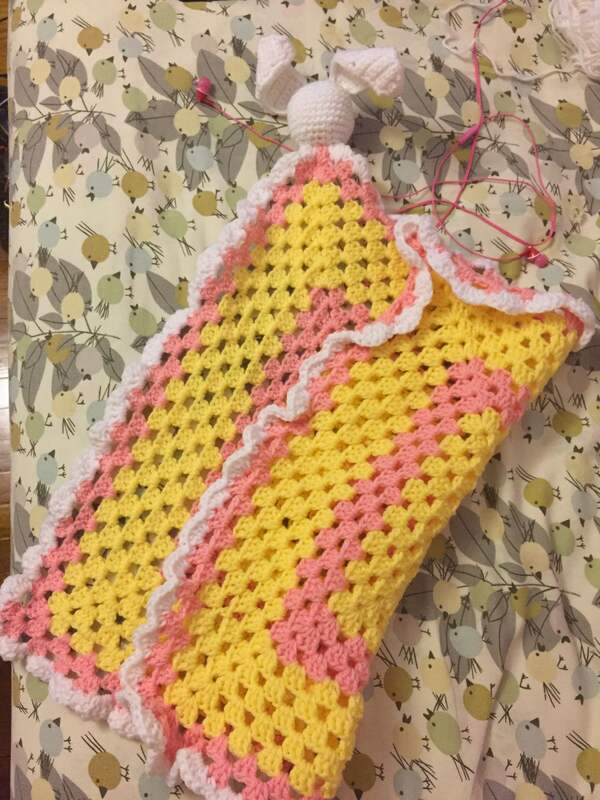 Also, surprisingly, the smaller the doll, the harder it is to make flattering to-scale dresses! In the end, it boiled down to me not wanting to accumulate two sets of clothes. I haven’t owned any other small scale dolls. Though, I am sorely tempted to buy a Hujoo Nano Freya and Rabi! Since they’re affordable, I wouldn’t feel too worried about doing their faceups myself, and since they’re like baby animals, I think I’d be okay with them Donald Ducking it or Mickey Mousing it … or Winnie the Poohing it (apparently, they can only wear a shirt or pants… Not both). I don’t find my aversion to different scales all that limiting actually. Right now, I’m really loving and wanting ALL the Azones, the Jerry Berrys, the Rurukos, the Licca Chans, and a Red Berry Doll. In my next post, I will hopefully be able to show you progress on my Marshall Lee inspired hybrid. I kind of wish obitsu and azone came out with a grey skin option, as I’m not comfortable spray painting or dying plastic myself. 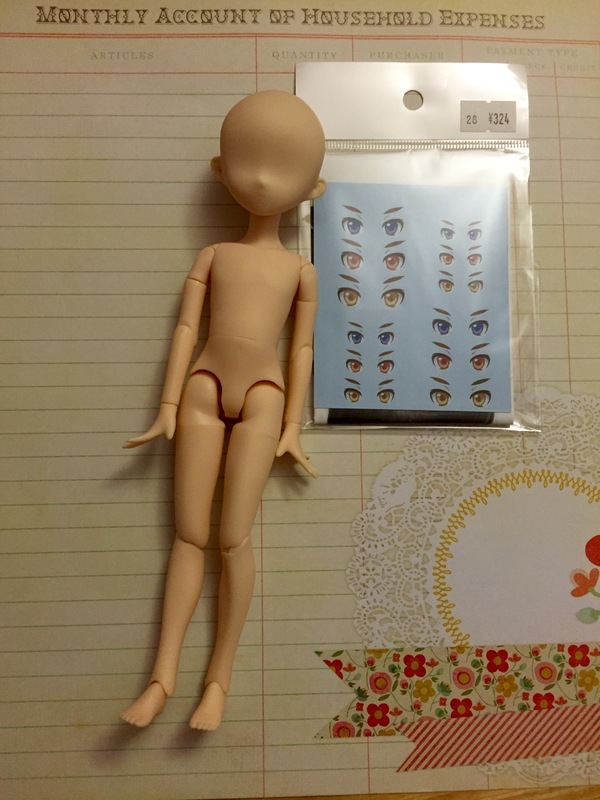 I purchased the Obitsu Petite P Chan head in white skin, the Parabox eye decals, and an Army Painter Psycho paint brush (not featured) from Junkyspot. The body is the Pure Neemo Flection XS boy in white skin. That background is ironically just a random bit of scrapbook paper. I hope the eye decals look good! Also, YAY it’s finally Friday!! I’m in a really weird doll mood. I’m currently back to being obsessed about the idea of repainting doll heads. I did this for two of my Ever After High girls (that I’ve since sold on evilbay), but I had a really hard time getting what I pictured in my head to translate on the doll’s blank face. Drawing and painting are not my fortes, but I go back and forth between accepting that I’m just not good at art to thinking I might get better if I just practice some more. 😦 When will I learn? I have major issues with drawing symmetrically and with with achieving depth in color and lines. I might try practicing sketching anime-style eyes before attempting doll repaints. Also, the next time around I will be using eye decals (thank you, Genius who invented the eye decal). I’m definitely going to hold off on buying any blank doll heads until Blythe Con has passed. I’m not sure how much I’ll be spending there, or if I’ll come home with a new doll in two weeks! Also, I’m not sure if I’m just going through a weird phase. Currently, I’m waiting on a Merry Go Round Licca doll and a Pure Neemo Flexion XS Boy body. not my photo! courtesy of google images. And if I can successfully put together a pure neemo version of him (Marshall Lee-esque – I won’t be spray painting his whole body and face grey, but I am getting the white pure neemo body and I will get the white obitsu head. ), I will be making Fionna the Human too ^^. I still have to attach the arms, and sew the face on. By the way, I’m super excited about this three day weekend. My plan is to get a ton done! Me: I wish I could go to blythecon. It’s being held in Chicago this year in October. (I mentioned this as we had talked about conventions in general earlier). Me: You know what blythe dolls are? Her: I love blythe dolls! Me: Did we just become best friends? I’m just kidding. That’s not how the conversation went (yay for random Charlie Bradbury reference! 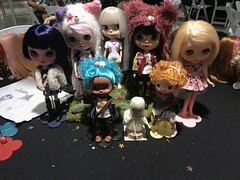 ), but we were both really surprised that we shared the same blythe doll interest. 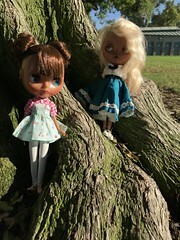 She has 2 neo blythe dolls, one of which includes a Bianca Pearl! She seemed mildly interested in going to any potential dolly meets and maybe even venturing out together to a park to do a photo shoot.. Neither of us have IRL doll friends, and we both agreed that it’s kind of crazy that the first doll lover we encountered in person was at work. It’s actually kind of heartening to find out that someone I know has the same niche interest as I. I don’t have very many people who I can talk to about blythes or dolls in general (I can definitely count them on one hand), and it’s exciting to be able to gush about dolls with someone out loud (gush, squee, whateva, whateva). My coworker and my initial conversations were more like long-run-on-sentences-with-no-pauses-between-words-and-punctuated-with-OMG’s-we-were-that-excited. ^^ Anyway, I hope everyone else is having a good Monday! I guess I have this problem where I need justification to make big purchases. Or approval maybe? So I made the big mistake of sharing with my mom the fact that I will most likely purchase another Blythe. Big mistake. (For backstory, I (28 years old) live with my parents, as does my younger sister. I really don’t have an intention to move out until I find a new job that relocates me to the west coast.). My mom got all upset when I brought my doll hobby up, saying that I should be saving money and thinking about my future. I have crazy Asian parents, stereotypically unforgiving, critical, and always struggling with denial. It’s hard to hold onto positivity when I’m living with negative parents. I find it insanely sad that a lot of emotional and psychological problems stem from a person’s relationship with his or her parents. But the years of struggling with my own issues has sort of taught me to be kinder to myself. For every few critical things that are said to me that hurt me, I force myself to think of one positive – because it’s just too easy to also be hard on myself. I understand the point that my mom and dad were trying to make this morning (a blow on my age, the fact that I’m living at home and kind of a mooch, and I’m not married, and I’ve developed this doll hobby in the past two months). But I also understand myself that there are a lot worse things I could be into at my age than dolls. I should probably look into moving out sooner, but that doesn’t fit into my 2-3 year plan, as unfair as that is to my parents for me to live with them I guess. ANYWAY, the two promotional pics of the blythes above are from the Junie moon site (Japanese site). I got SO FREAKING EXCITED when I saw Spright Beauty!! I was eyeing Pixie Peaceful (the middie), but I hesitated at the thought of accumulating two different size wardrobes. I really want a pink haired blythe. I even have the perfect name for one! I was contemplating getting a factory girl, but I’m not confident I can make her look like I want. The second photo is a (tentative?) 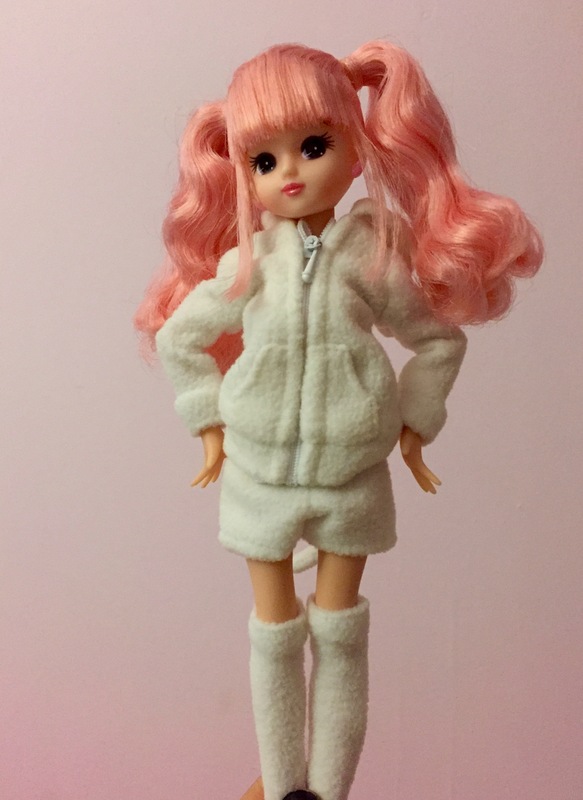 photo of the My Melody blythe. 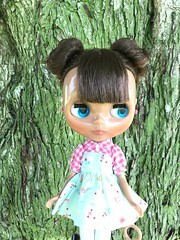 I love her color palette too, but I want to get a blythe with a different hair style than Finley. I miss my furbaby. And I can already tell today is going to be a long day.